Arcadia Rural Fire Brigade would like to acknowledge and thank all of the local businesses that support the work that we do. We have been intending to present this donation cheque to the Arcadia Rural Fire Service since our election day BBQ. The lovely ladies and gents of ARFS donned the apron, wielded the tongs, and controlled the gas and fames on 2 July 2016. Thankfully Arcadia Rural Fire Brigade don't take quite so long to respond to our local emergencies. We recently received a very generous donation from Mulawa Arabian Stud in Berrilee. This money will be put towards much needed equipment, and we are grateful for the on-going support of Mulawa and their commitment to the local community. Pictured below is Captain Dave Byrne and Senior Deputy Daniel Pertovt receiving a donation from the manager of Mulawa, Paul Stockman. Without the unwavering generosity of the local residents and businesses, Arcadia RFB would be unable to effectively and efficiently serve the communtiy. We would like to thank Bendigo Bank Galston, Eric’s Tender Meats, Hills Bus Company Dural, Arcadia Primary School, and Mulawa Arabian Stud for their ongoing support and donations in the past twelve months. We would also like to thank our local residents who support us. 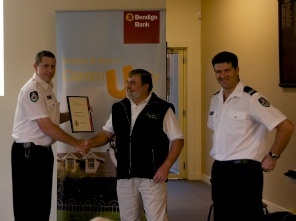 Bendigo Bank Galston has recently donated a digital data projector and screen to the brigade for essential training and community presentations. Presentation of the Data Projector at the Arcadia Brigade AGM in April. At our AGM in April, Bernie Triebe, the manager of Bendigo Bank Galston, presented the brigade with this vital piece of equipment. Eric’s Tender Meats, in Galston, have been providing Arcadia Brigade with support for our fundraising BBQs for many years and we truly appreciate their ongoing donations. Hills Bus Company Dural and Mulawa Arabian Stud have recently made generous donations to the brigade after we helped with community events late last year. To be directed to the websites of our wonderful supporters, please click their logos below.